In the last post, I shared an overview of The Grainfather, recommended equipment to use with it, and an overview of the brewing process. In this installment, I'm going to talk specifically about mashing and sparging. Having brewed over a dozen batches with it, I'm finally becoming very comfortable with the device, the mash process, and how to get what I want out of it. I don't consider myself a "master" of it yet, though. For those who have never done all-grain brewing, I want to provide a quick overview of the mash process itself. The goal of mashing is to turn the starches in the grain into sugars. More specifically, you want to turn the starches into a mix of fermentable and unfermentable sugars that provide the flavor profile associated with the beer you are brewing. A sweeter beer might warrant more unfermentable sugars. A more dry beer will demand few unfermentable sugars. To a great extent, controlling the amount of unfermentable sugars is a function of mash temperature. The lower the mash temperature, the more fermentable sugar you'll have in the finished wort and the more dry the beer will be. It will generally also be thinner in body and higher in alcohol. The higher the mash temperature, the more sweet and full bodied the finished beer will be. That's simplifying the mash process a lot, but it's a good basic rule of thumb. Extraction of sugar from the grain is primarily a function of the water-to-grain ratio, the enzyme levels of the grains, and time. The longer you mash, the more time the enzymes have to turn the starches into sugars. The higher the water-to-grain ratio, the weaker the enzyme levels will be and the longer it will take to convert all the starches into sugars. Experts like John Palmer suggest that an ideal water-to-grain ratio in a mash is 1.5 quarts per pound of grain. The Grainfather needs a little thinner (more water) mash than that, and tends to come out closer to 1.6 or 1.7 quarts per pound. I often compensate for this thinner mash by adding 10-30 minutes of mash time just to ensure full conversion, but that's not strictly necessary. It's important to note, but beyond the scope of this post, that there are different enzymes at work during the mash process. Each enzyme has a temperature range at which it works best, and one above which it is destroyed. For this reason, there are recipes that involve multiple temperature ranges or "steps" designed to allow specific enzymes to function before moving to the next temperature or step. The Grainfather can accomodate these "step mashes" by simply changing the temperature setting on the controller. Just before we end the mash, we increase the temperature inside the kettle to 168F or "mash out" temperature for about 10 minutes. This accomplishes two things. First, it stops most enzyme activity so that our flavor profile should be locked in. Second, it heats the grain bed so that the sparge water should flow more easily through it in the next step. At the end of the mash, the grain is removed from the wort and allowed to drain into the kettle. There will generally be additional sugar "stuck" to the grain at the end of the draining process. This is why we sparge or "rinse" the grain at the end of the mash. Sparging is the process of extracting the last of the sugars from the grain by running hot water through the grain bed and allowing it to drain into the kettle. You can definitely skip the sparging process if you want to, and you'll still produce a good beer. However, sparging is a great way to get the most out of the grain you spent your hard-earned money on. If you don't sparge, you'll need to top up the kettle with enough water to make the pre-boil volume. It's important to have your sparge water at the appropriate temperature (168F) and ready to go when you lift the grain basket out of The Grainfather. Once the initial water in the grain basket has mostly stopped draining, you'll want to start putting the sparge water in the top of the grain basket to begin rinsing the sugars off grain and into the kettle. In my experience (meaning this isn't the only way to do it), I've found that "batch sparging" or putting all the sparge water into the basket at the start of the sparge, works just fine. I've achieved very high efficiency doing this. It's probably faster than trying to fly sparge or gradually sparge the grain bed, but you can do what works for you. Here's an important note. If you are planning to measure your pre-boil volume at the end of the sparge, take a moment to stir the wort first. If you don't, you may find that your pre-boil gravity reading is very, very low. This is because the thinner sparge water will tend to sit on the top of the kettle while the thicker existing wort lives in the bottom. Stirring at the end of the sparge will homogenize the gravity and give you a more accurate reading. Having done this quite a few times, I've had the opportunity to make a lot of mistakes. I'd like to save you the trouble of making some of them. To get the gasket to stay on the bottom of the grain basket when you insert it, it is helpful to make sure the gasket is wet first. It will slide in place a lot easier. Ditto the top of the basket. I growled and grumbled a lot about what a pain this process is before I figured this trick out. When loading the grain, I use a scoop to sprinkle it on the mash water. Every few scoops, I stir the grain to make sure it's all getting wet. If you dump the grain all in at once, that's not going to be easy to do. My mash efficiency (per BeerSmith) tends to be around 88.5%. When putting the top on the grain basket, don't compress the grain bed but do try to get the top of the basket as far below the recirculation pipe as you can comfortably do. This will keep the mash water from overflowing. If you're using wheat and/or oats in the mash, make sure you include rice hulls. This will help the wort flow through the grain bed. Also make very sure to do a mash-out step to heat the grain bed before sparging. Don't lift the grain basket out of the kettle until you're ready to sparge. In one case, I thought I had a stuck mash and a lot of sediment (and grain bits) in the kettle. I lifted out the grain basket and set it aside while I scraped sediment off the heating element. This allowed bacteria in the grain to work on the sugars, souring the mash. The finished beer, instead of being slightly sweet, was moderately sour from this unintentional "mash souring". iMake's Graincoat accessory will help keep mash temperatures more steady. It also speeds up the heating of the wort quite a bit. Check the manual for each mash temperature you plan to use. There is a table in the manual that suggests changing the heating mode switch from Mash to Normal depending on the mash temperature you're trying to maintain. Ignoring this can cause the mash temperature to vary widely in some conditions. Consider pH 5.2 Stabilizer. This product is available from many brewing shops. I've found that I get a little better efficiency and beer when I use it versus when I don't. Your experience may vary, but it's not a very expensive substance to add to your mash. Don't add it until the grain is in the kettle. Why is this important? If you sparge with too much water, you're going to end up with a lot more in the kettle before you boil than you need. You'll end up having to boil the wort for a while before you get to the first hops addition, which will increase brewing time and might cause Maillard reactions in the kettle that darken the beer more than you intended. Time your sparge water heating. One method recommended in the manual is to boil your sparge water in The Grainfather, then pump it into your fermenter (or another vessel that can handle the temperature). The sparge water will gradually cool over time to sparge temperature and can then be poured onto the grain bed once the basket is lifted from the kettle. In my case, I use an induction cooktop and stainless kettle to heat my sparge water while the mash is underway. It takes approximately 30 minutes for this combo to heat water to 168F, so I start heating about 30 minutes before mash out so that my sparge water is ready to go when the grain basket comes out of the kettle. If you don't do this, there is a chance that bacteria in the grain could sour the mash a bit before your spare. At the very least, your total brew time will be increased significantly. If you heat sparge water in another vessel, consider dead space. In my case, I use a Mega Pot 1.2 on an induction plate to heat the water. I have this sitting on a hand-made table that's high enough to place the Mega Pot's valve above the height of The Grainfather's grain basket. This allows me to use gravity to transfer sparge water onto the grain basket. I don't have to lift the sparge water kettle and risk burning myself or spilling hot water. The down-side is that the kettle, as I have things setup, leaves about a gallon behind. So I have to add a gallon to my sparge water calculation to account for the dead space below the valve. That way I don't have to lift the huge hot kettle and pour out the last of the water. I can wait until it cools down and dump the leftover water in the sink and use it for cleaning. Calculate pre-boil volume you need. The US Grainfather boils off water at the rate of approximately 0.4 gallons per hour. For a 90-minute boil, that's 0.6 gallons. If you want 5 gallons in the kettle after a 60-minute boil, you need 5.4 gallons in the kettle before the boil begins. If you're doing a 90-minute boil and want 5 gallons, you'll need 5.6 gallons of wort in the kettle at the start of the boil. If your sparge water calculation was off, you may need to boil longer than planned (if you had too much) or add water to the kettle before boiling (if you didn't have enough wort). Following all these tips has helped me to achieve correct pre-boil volumes and gravities, which in turn ensure that my post-boil volumes and gravities line up as well. Late in 2015, I made the switch from extract brewing to all-grain. I had made some really good extract beers prior to that switch. Switching to The Grainfather and all-grain brewing at once was like learning to brew all over again. All-grain brewing is different from extract brewing up to the point at which you start boiling the wort. Brewing in The Grainfather is different from brewing with other equipment. I'm not saying that either is necessarily better or worse, just that it's all different. Any time you introduce a change into your process, you introduce a need to learn and experiment. I'm hoping in this post to share things I've learned about brewing all-grain beers with The Grainfather so that the rest of you won't make some of the mistakes I did. Note: This post refers to the US model of The Grainfather and may not apply to non-US versions. A stirring paddle or spoon to stir the grain in the mash basket and possibly during the boil if you're adding syrups, extracts, etc. An accurate scale for weighing grain, hops, and other ingredients. I recommend something digital with the ability to measure in pounds, ounces, and grams. A vessel for storing and/or heating at least 3-4 gallons of sparge water. I personally prefer an induction-ready kettle and induction cooktop but anything that can heat 4 gallons of water to 168F is good enough. A fermenter to store the beer during fermentation. I personally like SS Brewing Technologies Stainless Steel Brewmaster Bucket, but there are lots of other good products on the market. You can also go with the good old glass carboy or a plastic bucket if you want. Hops socks to keep hops particulate out of the beer. I don't know that these are strictly necessary but I prefer to use them. An electric outlet near where you're brewing. If you need an extension cord, make sure it's a heavy-gauge one that can handle a 1600 watt draw without overheating or causing voltage drop that will slow down boiling time. Powdered Brewer's Wash (PBW) or a similar cleaning solution. PBW is recommended in The Grainfather manual and works very well in my experience. Power: A common question people ask me, because they've seen the Braumeister and other all-grain brewing setups that need a 220-240V outlet, is what kind of power requirements you have with The Grainfather. The Grainfather uses a standard 3-prong plug like most modern electric appliances and draws about 1600 watts, which is comparable to a high-end hair dryer. If you can run a hair dryer from the outlet, you can probably run The Grainfather. If in doubt, consult an electrician. Brewing Time: Your experience may vary, but I found that I could do an extract batch in as little as 3 hours with my kitchen stove, a Mega Pot kettle, and an immersion chiller. All-grain brewing with The Grainfather has rarely taken me less than 6 1/2 hours, and sometimes takes much longer. Be prepared to spend more elapsed time brewing. Heating: The Grainfather features a 1600-watt 120V electric heating element. This heating element in my experience will raise a 5-gallon quantity of water or wort about 1 degree Farhenheit per minute. If you add the Graincoat accessory, which I recommend, you'll see heating of about 2.1F per minute. That is a massive reduction in brewing time. You'll also get a little more vigorous boil with the Graincoat. Mashing: The Grainfather mash process is pretty easy. Measure and crush your grain. Calculate the amount of mash water you'll need based on a formula in the manual and fill the kettle with that amount of water. Drop in the grain basket. Carefully stir in your grain, making sure to get it all wet. Insert the top grate on the basket, making sure not to compress the grain bed. Attach the overflow cap on the tube. Put on the glass lid. Attach the recirculation tube. Turn on the pump and make sure the wort is circulating. Let it finish mashing. For a step mash, you will need to set a timer and come down the adjust the setting on the temperature controller for each successive mash step. When mashing is over, turn off the pump, remove the lid, lift out the grain basket and set it on the kettle to drain. Sparging: It's not talked about much, but The Grainfather (out of the box) doesn't really address sparging of the grain. What I wound up doing was purchasing an induction cooktop on Amazon and setting my old extract brewing kettle (Mega Pot 1.2) on top. When I've calculated the mash water I need, I also calculate the sparge water and add about a gallon to cover dead space in the kettle and the possible need for more wort. About 30-40 minutes before the end of the mash, I turn on the induction cooktop and set it to high. By the time the mash is finished, the water in my kettle has heated to sparge temperature. I attach a length of temperature safe hose to the Mega Pot valve and let gravity draw the sparge water from the kettle into the grain basket. This makes sparging very easy. If I didn't have this setup, I'd have to heat sparge water another way and pour it into the grain basket by hand. This is something you'll want to think about before you purchase and use The Grainfather. Boiling: It's not widely documented, but The Grainfather boils off about 0.4 gallons per hour. It does generate a rolling boil, but it's definitely NOT the equal of a propane burner or even a good, strong kitchen stove burner. It's good enough to produce a nice beer, though you find as I do that a slight chill haze exists in the finished beer. Chilling: The counter flow chiller included with The Grainfather is nothing short of amazing. Pumping 212F wort in one side, 70F tap water in the other, will cause the wort going into the fermenter to be around 83F instantly. If you adjust the valve to reduce the flow through the counter flow chiller, you can drop that temperature further but it will take longer to pump the wort out of the kettle. I find that it takes around 15-20 minutes to pump the entire batch out. Cleanup: The cleanup process consists of emptying the grain basket, cleaning the grain basket, kettle, recirculation tube, and counter flow chiller. For me, this is usually a 30-minute process from end to end. I clean the equipment using hot water and PBW (powdered brewer's wash). I put about 3 gallons of water and PBW in the kettle. Using a kitchen sponge, I clean the grain basket, stirring spoon, and kettle. If the cleaning solution is relatively clear, I'll use it for the remaining steps. If not, I dump it in the sink and mix a second batch. I do this to avoid sediment getting stuck and built-up in the pump, recirculation arm, and chiller. It's not strictly necessary according to the manual. With the kettle and grain basket clean, I attach the recirculation arm and turn on the pump. This allows hot cleaning solution to run through the pump and arm to clean them. Then I turn off the pump, attach the chiller, and run the wort exit tube into the sink. I pump the hot cleaning solution through the chiller and into the sink. This cleans the chiller. Now, I fill the kettle with 3 gallons of hot water again. I run the hot water through the recirculation arm for about 5-10 minutes, then pump it through the chiller and into the sink. I dump out any leftover water in the kettle and dry it with a clean towel. I dry the grain basket and other things with a clean towel, too. This whole process typically takes about 30 minutes. It may be longer if anything scorched on the bottom of the kettle, or less if the wort was particularly clean. In the next installment, a week from now, I'll talk about mashing and sparging in The Grainfather, the mistakes I've made, and what I have learned to improve that process. Recently, I've been trying to "dial in" settings in BeerSmith and Beer Tools Pro so that I can do a better job getting my actual brewing results to match up to the figures in the software. Below are some of the figures I've worked out with my US Grainfather. Given manufacturing variances and possible measuring errors on my part, these might not match exactly to yours, but hopefully they're close enough that it will help you. If, as I do, you use hops bags to keep particulate out of the kettle, you may want to factor in adding about 10% additional hops to account for possible losses due to the bag. One of the beer styles I've wanted to brew for a while is a cream ale. It's a nice, light, refreshing style that is easy to enjoy during the warmer months. With summer approaching its end, I thought maybe it was time to brew it. The recipe I'm using in this case is based closely on the Kari's Cream Ale recipe on the American Homebrewer's Association web site. This recipe won a gold medal at the National Homebrewer's Conference in 2008, so it seemed like a good choice. Using BeerSmith, the BJCP style guide, and calibrations based on my recent experience with The Grainfather, I had to modify the existing recipe. My brewhouse efficiency with The Grainfather is pretty consistently coming out at 80%, so the original recipe's grain amounts were decreased to get the beer closer to the figures stated in the AHA recipe. Note: Only after this went in the fermenter did I realize that I added a pound of corn sugar instead of the 8 ounces the recipe called for. My actual measured efficiency for this batch was calculated to be 79.4%. 3.75 gallons of mash water was placed in The Grainfather and heated to 149F. The grains were freshly crushed while the water heated, and were carefully stirred into the grain basket. 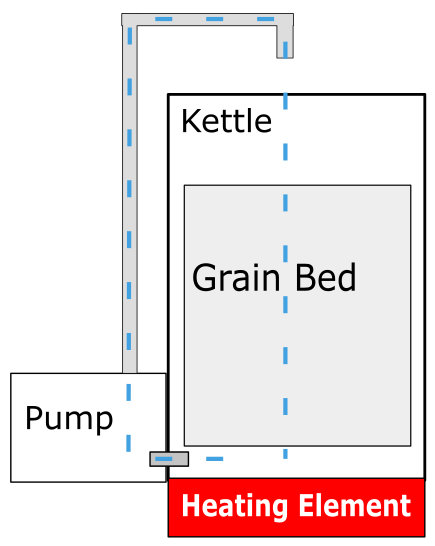 The lid was placed on the grain basket, the overflow pipe attached, the lid put on the kettle, the recirculation arm attached, and the pump started. The pH 5.2 mash stabilizer was added at this time. The grain mashed at 149F for 40 minutes. The temperature setting was raised to 154F per the recipe, and the mash continued for 20 minutes longer. The temperature setting was raised to 170F and a 10-minute mash-out began. The grain basket was lifted and allowed to mostly drain, then 3.5 gallons of sparge water at 168F were batch sparged on top of the grain basket. While sparging, the kettle temperature setting was increased to 190F. This resulted in approximately 6.1 gallons of wort in the kettle pre-boil. The corn sugar was added and the wort stirred well to generate a whirlpool. This resulted in approximately 6.1 gallons of wort at a gravity of 11.9 Brix or 1.048 SG. At 7 minutes, attached the counter flow chiller and recirculated boiling wort through it to sanitize the inside of the chiller. At 90 seconds, added the 0.55 ounce hops addition to the kettle in a hop sock. At flame-out, recirculated wort into the kettle until the kettle temperature dropped to 160F. Pumped wort into the sanitized SS Brew Tech Brewmaster Bucket fermenter. The temp inside the fermenter was approximately 80.5F. The OG of the wort was measured at 13.1 Brix or 1.053 SG. This is 2 SG points higher than the original AHA recipe, probably because of the 8 ounces of added corn sugar. The volume in the fermenter was approximately 5.25 gallons. The original recipe called for pitching the yeast at 64F and keeping it there for 12 days. Since I was using dry yeast and that normally does better when rehydrated in warm water before pitching, I pitched the yeast while the fermenter temperature was still 80F. I attached my cooling system and set it to work reducing the fermenter temperature. The control system was set to 64F. Heating would kick in if the temperature reduced to 62F (unlikely since the room's ambient temp is about 68F). Cooling would kick in if the temp exceeded 68F. When I checked on the beer approximately 12 hours after pitching, the temperature was 69F. I grabbed some ice packs and added them into the cooling jacket to help lower the temp more. The beer went into the fermenter on August 13 around 10:30pm and will be fermented for 12 days. It will likely be bottled between August 25-27. I'm expecting this beer to possibly come out a little drier than intended due to the added corn sugar. It will also end up a little outside the BJCP guidelines at 6% ABV instead of 4.2% to 5.6%. Fortunately I don't plan to enter it into a competition. I'm also curious to see if increasing the hops amounts by approximately 10% solves a lingering low bitterness problem I've had with some recent batches. I'd read that using hops bags can reduce bittering efficiency by as much as 10%, and wanted to see if this beer comes out closer to what I expect it to. If so, I'll be adjusting hops amounts upward from here on. In extract brewing, there is no mash step. The brewer may choose to steep some specialty grains to grain the flavors they offer, but the mashing was done by whoever created the malt extract used to produce the beer. The benefit of extract brewing is that you save time and don't need as much equipment. The down-side is that you have less control over the flavor of your beer. Decoction mashing: A portion of the mash is drawn off and boiled in a separate vessel, then added to the mash tun to heat it up. In this style of mashing, there's no heat applied to the main mash vessel - only to the portion drawn off and heated separately. This is the most time-consuming mash method but is common in European beers. Infusion mashing: Water at a target temperature is added to the mash to instantly raise it to the desired temperature, thinning the mash a little in the process. This is the most common method used by home brewers. Temperature mashing: In this technique, heat is applied directly to the mash vessel to raise it to the target temperature and keep it there. It's most commonly used by professional brewers. The Grainfather is something of a mix between Infusion mashing and Temperature mashing. It's known as a Recirculating Infusion Mash System (RIMS). In a RIMS system, a heating element provides direct heat to the mash vessel - just as would happen in a Temperature mashing system. In addition, The Grainfather includes a pump and tubing which draw wort from below the grain bed and above the heating element, pump it to the top of the kettle, then allow it to pour through the grain bed. 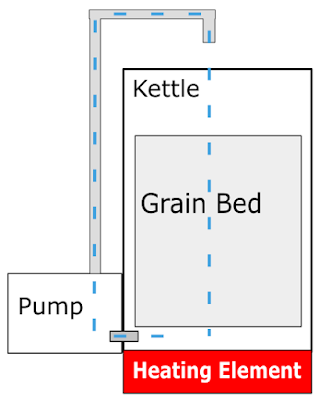 The diagram below illustrates a RIMS system like The Grainfather. The dashed blue line represents the movement of wort through the system. In a RIMS system like The Grainfather, one of the biggest risks you run is scorching the malt or caramelizing it near the heating element. As long as the recirculation pump is doing its job, pulling hot wort from the bottom of the kettle and moving it to the top, scorching is less likely. Even so, the designers of The Grainfather built it with a thermal cut-out switch (kind of like a temperature based circuit breaker) that will disable the heating element if the bottom of the kettle seems to be scorching and heating up. It's definitely possible to scorch some of your wort with The Grainfather (I know because I've done it) but it's not a common situation. Mash temperatures tend to be very steady compared with infusion mashing in insulated containers. Wort tends to be clearer because it's filtered through the grain bed. Although the overall mash temperature remains steady, small amounts of mash are heated at the bottom of the kettle, cool a bit as they pass through the pump and tubing, then heat up again when the return to the kettle. Thus, temperature control isn't steady across the entire mash volume. Clearer wort isn't necessarily better. Some of the substances which cause wort to be cloudy can actually serve as yeast nutrients. There is a potential for scorched wort that doesn't exist in a traditional infusion mash system. Some claim that the slow movement of wort through temperature steps in step mashes will lead to thinner beers that don't have much of a head. RIMS systems are more expensive than most standard infusion mash setups involving insulated mash tuns and separate water heating vessels. In my experience, adding a bit of Carapils or Melanoidin malt to a recipe solves the foam/head problem. I've always used yeast nutrient in my beers, so if the clearer wort has caused my yeast trouble, they didn't notice it as they were able to find plenty of nutrients elsewhere in the wort. Scorching of a small amount of wort has occasionally happened, but it's pretty uncommon. As for the expense, having a turnkey all-in-one system has been helpful for me. If it cost a little more, that wasn't a huge problem for me.